Translation – With their minds deeply attached to worldly pleasures and their intellects bewildered by such things, they are unable to possess the resolute determination for success on the path to God. Translation – The Vedas deal with the three modes of material nature, O Arjun. Rise above the three modes to a state of pure spiritual consciousness. Freeing yourself from dualities, eternally fixed in truth, and without concern for material gain and safety, be situated in the self. Its all about money, right? Money is such an attraction that human beings always want more of it. Money brings creature comforts, material possessions, fame and finally power. Power is the ultimate aphrodisiac and money supplies it. No wonder everyone wants to be rich and famous. That money, fame and power cannot bring happiness or fulfilment is only realised when someone rich and famous commits suicide. Lord Krishna is giving the same message through these two verses. Getting too involved in material pleasures and comforts, distracts one from the path of achievement. Modern dual-income families living in the cities in India have a lot of disposable income and their kids rarely hear the word “no” … their vacations are always abroad, even school excursions happen in some foreign country and their buses and classrooms are air-conditioned. When these kids grow up their tolerance for failure and any kind of adversity is extremely low. The focus is largely on material comforts and rarely on striving to achieve their goals. There are other health impacts too -childhood obesity leading to a range of diseases and consequently a poor quality of life. Material pleasures, creature comforts are all good within limits. Teach your kids to be resilient and to value fulfilment, which comes from contributing to the society, from forming deep relationships and doing meaningful work. On the material plane, it becomes necessary to balance material and spiritual needs. While I have minimal desire for excess, and could be called an “ascetic” because of my love of simplicity, I still have to eat and participate to some extent in the society around me, such as the power grid, or having a car to get groceries. And, there are always taxes. I believe the desire for excess, or for public adulation, comes from a basic insecurity and fear of lack. This is reinforced over and over by the larger society, and maybe more so since the world has become so interconnected. Unfortunately, American pomp and glitter have infected the world, but I guess cultures like India’s have traditions that favor the wealthy and self-indulgent, too. 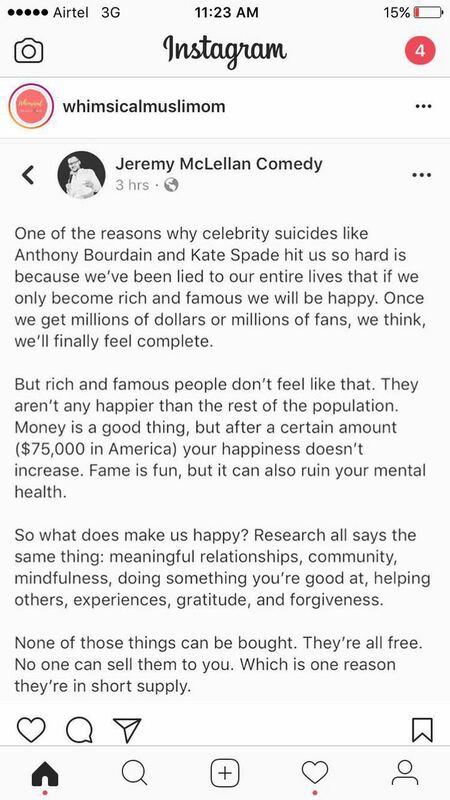 Wealth and fame don’t necessarily make people happy. It just changes their roles, but the inner person remains.